Seven years ago, I decided to go to graduate school, because I don’t ever want to qualify for food stamps again. I want them to be there for people who need them, and I am all good with my tax dollars going to do that. In fact, I’m pretty good with my tax dollars going to all kinds of things that make other people jump up and down and throw big fat tantrums. Things like public education – from pre-kindergarten through college – and health care and green space and road repair and publicly funded transit and art and music. I even like having my tax dollars go toward police and fire and prisons. And speaking of cross words, I got an e-mail yesterday from my friend Saundra. Her son is my very favorite son-in-law. Saundra also has a master’s degree in library science, but she got hers at a more sensible point in her life. So she’s been a librarian for something like 30 years, and has deep connections in that world. I am a baby librarian, and still very idealistic. Or was, until Saundra’s e-mail asking whether I’d heard that the Council of the American Library Association, of which I am a member and which is meeting in Chicago this weekend, is taking up a resolution to boycott three American companies (Caterpillar, Hewlett Packard and Motorola) for doing business with Israel – specifically the IDF, its armed forces. 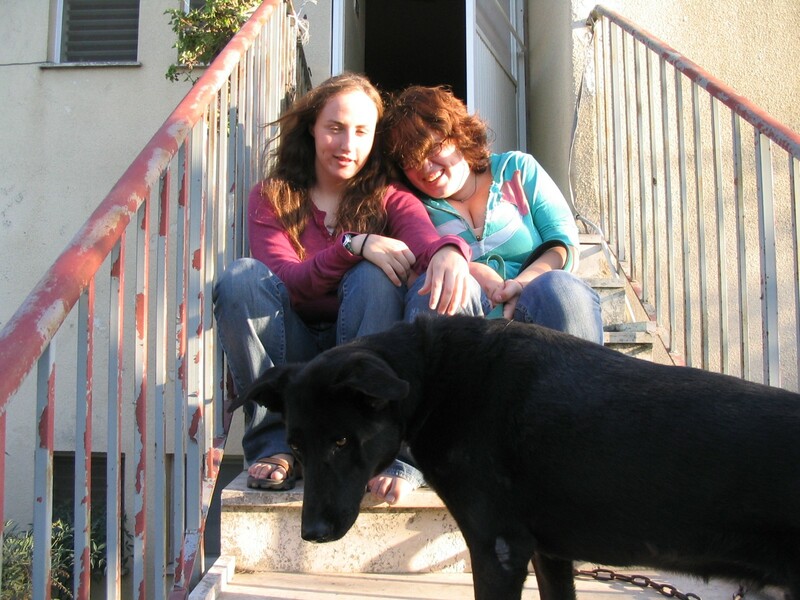 My two youngest offspring in Israel with Shelli Beham. Shelli’s humans Danny & Arlene were my adopted parents when I spent a year living at Ma’ale HaChamisha, a pre-1948 kibbutz 22 kilometers outside of Jerusalem. I am having a big problem with this. For starters, the Council is doing this on a Saturday afternoon, which is the Jewish Sabbath. I know, I know – this is about Israel, not Jews. But…hmmmmm….Israel? Jewish state? Anyone see any sort of connection? I had a whole bloody comprehensive exam question on cultural warrant and its importance in librarianship. I have a problem with the resolution all on its own already. Now I have the extra problem of feeling like the ALA Council is a great big sneaky baby with its fingers in the cookie jar because it knows Mom is on the phone. Which I would not have had if it had scheduled this voting session on, say Sunday afternoon. Then there’s the whole idea of the ALA Council voting on this. (I’m not going to even get in to the question of whether this is an appropriate issue for this particular governing body to address.) Really, ALA Council? I get the whole “commitment to social justice and fairness” thing. I even agree with it. Here’s my problem: If the ALA wants to put to a vote a decision divesting itself of any investments in American companies doing business with Israel’s military, then it needs to do the same with American companies doing similar business in Sudan, Iraq, Syria, China, Saudi Arabia, Nigeria, Liberia, Congo, Angola, Russia and others. I could go on with my list of countries engaging in naughty behavior, but I won’t. I also won’t get into how I feel about a group that prides itself on scholarship and accuracy of information taking on a really complicated issue in a manner that is reductive and simplistic. Not going to go there. I have no clue as to what will happen on Saturday afternoon. I wasn’t planning on going, but if any of you library types think I should show up, maybe I will. I’m going to end this little rant with a throwback post I wrote some five years ago. I was just playing with bloggy formats between grad school assignments, and I think I let about seven people see what I was posting. Ugly and frightening pretty much sums up the latest chapter in Israel’s relationship with the rest of the world. My latest scheme to institute Peace in the Middle East involves feral cats. I have no idea how, but it seems that trying to solve the feral cat problem has caused as much anguish for some people as the Middle East situation has for others. And there are other similarities. Feral cats are stubborn and difficult to deal with. Dealing with them requires a great deal of finesse and patience. And there are no guarantees that you’ll get the results you’re looking for – trust, affection and a chance to get them neutered or spayed and the chance to love them the way they deserve to be loved. The ironies are killing me–e.g., that this association with so much to say about inclusion and the free exchange of ideas would hold this particular vote on a Saturday. here on havdalah, the timing of the vote speaks volumes. so im curious to hear the results of what i thought was an avowedly ecumenical organization censoring itself. either way, we send in the cats. ok, did i miss a chapter…. what’s with the feral cats? ?